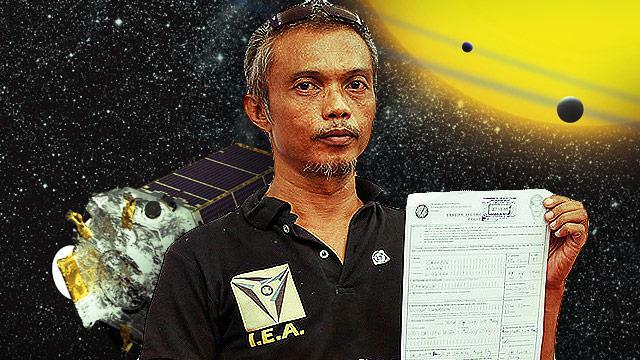 Ever since he filed his certificate of candidacy for president last year, Allan Carreon, popularly known as the "Ambassador of Intergalactic Earth," has never left the Internet's eyes. He claimed that he was urged to run for the position by aliens who communicate with him via a Facebook group. Yes, his "Sa plataporma ho, number one is wi-fi para sa buong Pilipinas. And second, yung territory ng Pilipinas. Kaya nating gawin yan. Basta ipanalo ako ng buong bansa. Kakausapin ko lang ang mga intergalactic," line certainly left us, well, hypnotized. But alas, he was disqualified from running. And we were heartbroken. Thank heavens (or aliens?) though, a Facebook page dedicated to his awesomeness surfaced. More aliens?? More galaxies?! Yes! But if you really need to go...say hello to the aliens for us!